Welcome to \"The Log Cab-Inn\"(opened in February 2007), where great memories are made. We are your destination spot for snowmobiling, skiing, snowshoeing, four-wheeling, hunting, fishing, hiking, biking, and year-round vacations. 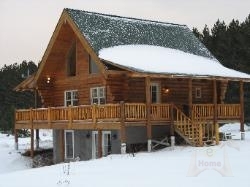 This evergreen retreat is located in Michigan\'s scenic Upper Peninsula, along the North Freda ATV/snowmobile trails just five miles outside of Houghton.